WASHINGTON, DC (August 30, 2018) – The Corps Network is pleased to announce the receipt of nearly $6.5 million in AmeriCorps State and National grant awards from the Corporation of National and Community Service (CNCS). These funds will support the continuation of The Corps Network’s AmeriCorps Education Awards Program (EAP) and Opportunity Youth Service Initiative (OYSI), and will support the creation of a new program: the Transportation & Infrastructure Program (TIP). Over the course of the coming program year (October 1, 2018 – September 30, 2019), the EAP, OYSI, and TIP programs will engage more than 4,200 youth, young adults and veterans at 44 organizations of The Corps Network. These AmeriCorps members will have the opportunity to collectively earn $10.3 million in Education Awards (scholarships) upon successful completion of their service. Started in 2000, the EAP is the largest AmeriCorps program The Corps Network administers. Since its creation, the program has supported roughly 50,000 AmeriCorps positions. During the 2018 – 2019 program year, the EAP will support 3,356 AmeriCorps members across 42 states and the District of Columbia. At the end of the program year – the first in a new three-year grant cycle for EAP – the AmeriCorps members will be responsible for improving 44,000 acres of public land and 2,450 miles of trails and waterways; and collecting 2,500 tons of recycling. In addition, the AmeriCorps members, many of whom are opportunity youth, will be provided educational and economic opportunities designed to lead to jobs and careers. Corpsmembers will also leverage an additional 4,000 volunteers. EAP concentrates on the CNCS focus areas of Environmental Stewardship, Disaster Services, and Economic Opportunity. Since its creation in 2013, the OYSI program has supported more than 2,600 AmeriCorps positions at member organizations of The Corps Network. The OYSI is designed to engage diverse youth and young adults in environmental stewardship projects that improve access to public lands and promote energy efficiency in low-income housing. At least 80 percent of the participants in OYSI are “opportunity youth”: young adults between the ages of 16 and 24 who, prior to the start of their term of service, have been unemployed for at least six months. 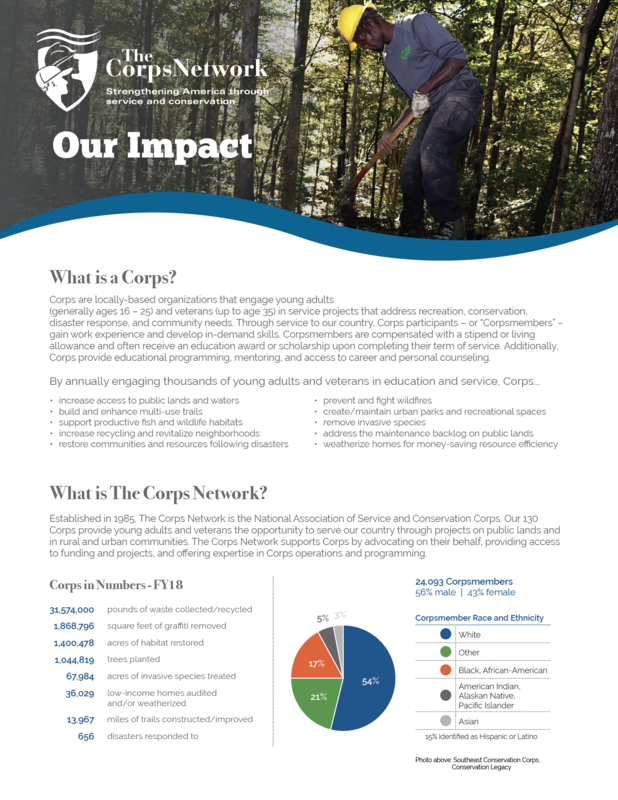 Through their participation in the program, Corpsmembers connect with educational opportunities, develop valuable job skills, and are exposed to various career options. During the 2018 – 2019 program year, OYSI will engage 770 AmeriCorps members across 16 states. At the end of the program year – the third and final year in a three-year grant cycle for OYSI – the AmeriCorps members will be responsible for improving 1,673 acres of public lands; creating and improving over 130 miles of trails and rivers; and increasing the energy efficiency of 1,550 housing units and public structures. During the program, Corpsmembers will obtain work-readiness and technical skills, and learn how to pursue jobs. Additionally, 80 percent will obtain industry-recognized credentials, and 50 percent of Corpsmembers entering the program without a GED or High School Diploma will attain one. The AmeriCorps members will also leverage an additional 1,840 volunteers, who will be engaged in public land and trail projects. OYSI concentrates on the CNCS focus areas of Environmental Stewardship and Economic Opportunity. Through the Transportation & Infrastructure Program (TIP), Corps will engage about 123 diverse youth and young adults, primarily ages 16 to 25 (up to age 35 for veterans), in public lands and transportation infrastructure projects in multiple communities across 13 states. TIP members will be responsible for improving 2,900 acres of public lands; 60 miles of roads, trails and waterways; and 370 structures. Corpsmembers will address the critical need for improvements to our nation’s infrastructure. Corpsmember service activities will specifically focus on increasing access to and utilization of our public lands and waters, and promoting transportation alternatives, enhancements, and safety. This program is aligned with the CNCS targeted priority of Infrastructure.